As the highest paved crossing of the Continental Divide in the U.S. Independence Pass is always going to have a special place in the heart of cyclists living or visiting Colorado. Best known for its silver and skiing, from Aspen (in the west) the climb is 19.5 miles / 31.4 km and although long it’s the altitude that you really need to watch out for in this neck of the woods. Starting the day at an elevation that rivals some of the most prominent peaks in Europe, unless you’re well acclimatised you’re definitely going to feel the lack of air right from the gun. 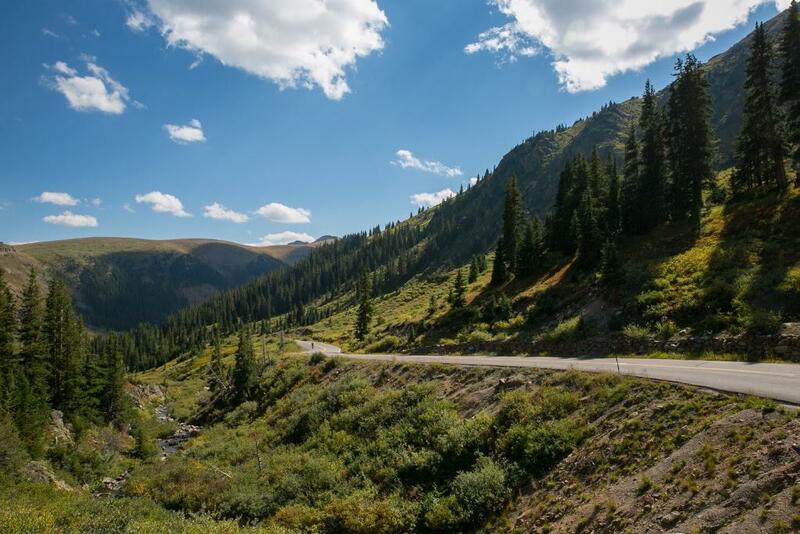 Fortunately the gradient is never too steep, generally hanging around 4-6% all the way, allowing you to appreciate endless landscapes alongside the Roaring Fork River on your journey to 12,095ft (3,687m). With 3 miles (5 km) to go you pass the Independence ghost town, today a very different place to what it would’ve been in its heyday in the late 1800’s. It’s from this town that the pass took its name, prior to this it was known as Hunters Pass. With no road markings or signs at the side of the road indicating how far you have to go it’s a welcome landmark, and from here you can just about trace the road in the distance all the way to the top. I’d wanted to ride Independence Pass for such a long time, much like the famous climbs in Europe it had a certain lure that I wanted to see for myself. I think the first time I got a good look at it was when the pros were racing up it in the (now defunct) USA Pro Challenge, and I remember being in awe at the road as it climbed through the forest and out into the vast expanse of the Rocky Mountains. Such a beautiful climb and one that I’m very glad to have now experienced.